The verdict is now in: the jury has agreed that Ward Churchill was unlawfully fired for expressing his political beliefs. The jury also decided that Ward Churchill was not entitled to more than $1 in damages, having earlier learned from the judge that this was the lowest amount possible that could be awarded (a jury question earlier in the day asked if $0 could be awarded). It is still up to the judge to decide if Ward Churchill is to get back his job at the University of Colorado (see the post that follows this one for more on this). In the meantime, entirely sidestepping the fact of their own illegal behaviour, some of those who abused their authority to try to carry out intellectual cleansing in the name of their white fatherland, such as former CU President Hank Brown, a right wing politician who was also involved with an organization devoted to ridding American university campuses of left wing dissidents, said that Churchill getting his job back would be a travesty of justice. CU Regent Michael Carrigan’s interpretation of the result was, somehow, that the jury agreed with CU that Churchill had engaged in academic misconduct. The verdict came at 4:00pm local time. Churchill, the media, and followers of the trial remained in the courtroom for the entire day waiting for a verdict to be reached today. I waited with some anticipation, regularly checking the Colorado Daily’s Twitter feed and the #wardchurchill page. The Daily Camera also maintained its live blogger, John Aguilar, in place to await the verdict. I said before that I would not be surprised by any outcome that the jury would decide. Clearly, the core of Churchill’s case was indeed vindicated: “I didn’t ask for money,” said Churchill, who was joined by his attorney, David Lane. “What was asked for and what was delivered was justice” (source). At the same time, thinking about the possible intentionality expressed through monetary symbolism, a spokesman for what is now a discredited CU said the monetary award offered “some vindication” (source). It certainly throws the university a lifeline, when it could have been easily crippled by a large monetary penalty, not that CU avoids hefty costs in legal fees for itself and Churchill, plus back pay. For those who structure their entire worldview around cash and conformity, the fact they have been found guilty of an abuse of authority in conducting what was effectively a political purge, seems to be minimized. As if to emphasize the fact that he did not care about money — indeed Churchill’s legal team never specified that it was seeking any amount, simply compensation. On this point, apparently the jury did not agree, which of course raises the question that if the first part of their verdict holds, then how does the second one follow from it? I will have more to write about this in the future. In the meantime, I celebrate! Victory for Freedom of Speech! 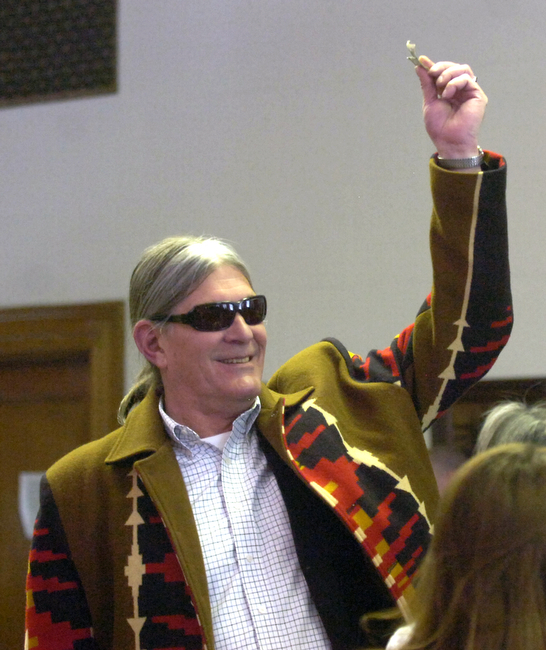 This is what Ward Churchill shouts to the courtroom audience as he holds a dollar, after he was awarded one dollar in damages from the school in his trial in Denver, Colorado Thursday afternoon April 2, 2009. Photo by Paul Aiken / The Camera / April 2, 2009. “Churchill wins his case, awarded $1 in damages — Reinstatement at CU to be decided at future hearing,” by John Aguilar, The Daily Camera, 02 April 2009. “Brown: Churchill’s return to CU would be a ‘travesty’ — Judge will decide later whether to reinstate professor’s job,” by Brittany Anas, The Daily Camera, 02 April 2009. Hurray for you – now would you tell the jerk to stop saying he’s Native American unless he comes up with some proof! It’s embarrassing to be associated with him in any way, shape, or form. What a foolish statement, you should be ashamed of making such a brazen racist statement in public. Who are you to act as arbiter of someone’s identity and, most stupidly of all, to demand “proof”? Why don’t you prove who you are, instead of hiding behind an anonymous identity like another in the legion of cowards who use the Internet to fire off lies and slander against people like Churchill. Trust me, there is far more pride to be had in associating with Churchill, than to be found in the same league as the right wing racist nuts like yourself. Now you can go back to dreaming about the day there are no longer any Natives in North America, and take your white sheet with you, scumbag. There was some serious anger in that comment. Ordinarily, I might have apologized, but this is how I write when I am utterly disgusted. The comment ultimately resorts to a racist basis, and I simply cannot accept that on this blog. The “proof of Indian identity” concept, aimed at someone who is not seeking membership in a federally recognized tribe, strikes me as a fairly clear instance of genocide-via-definition, almost as if one should be surprised that there is anyone left who can be identified as “Indian.” Ward Churchill has been through his roots endless times; anyone demanding more proof is simply engaging in harassment. Nice to see you happy, Max. I’m the farthest thing from a professional social scientist. There is the verdict, and then there is that other issue – actual research misconduct. So Max – help me out. I have a few naive questions. (1) Did Ward Churchill invent and propagate a false story about the U.S. Army intentionally infecting Indians with smallpox blankets? (2) Did he write articles under other people’s names and then cite the articles as independent verification? (3) Do you consider either of these things to be acceptable practices? You are asking me to go back through what has already been established in this trial, which I have already covered to a great extent, and has been covered to an even greater extent by the sources I listed in each of my posts. I do not think your questions are naive. Instead I think they are quite deliberately chosen. What you have not done, however, and this may perhaps be the naive part, is to explain and justify that choice of questions, and why after all that has been said and learned, why those are even the significant questions. That is especially true now that a jury has waded through masses of minute detail and concluded, quite plainly, that there was no justification for the firing of Ward Churchill. (1) The question should have been if he knowingly propagated a false story, and whether there is any such thing as a “true” story surrounding those events. One professor on the CU investigative committee and witness for CU’s defense, Jose Limon, expressed a very jejune view that there is only one truth, and no alternate interpretations are permissible. He is wrong, a professional social scientist who is more naive than you claim to be. There is truth, which in itself is an interpretation of reality. (2) He cited his own work. That is normal practice. That he cited it as “independent verification” suggests that you were inside his head, and you impute an intentionality that I do not believe was there. (3) Given my answers, my final answer is: YES. But Max – just to look at one question – he didn’t simply cite his own writing. Yes, people do that all the time. He cited his own writing with other people’s names on it and his own authorship not disclosed. That’s different. ‘Other people’s names’ is where the intentionality is suggested, at least to me. Would you ever do that? If not, why not? I mean, if I did that, and was discovered, I would have been thrown out of school or fired from my job. Regarding the naivite’ of my questions – I think if I indicated otherwise, you would blow your top and demand to know my credentials. They are in fact naive questions. I don’t work in any related field. The choice of questions was because I am aware of some issues, but not all of them, and these strike me as fairly clear cut. See JUROR BETHANY NEWILL’S INTERVIEW about halfway down the page. I base my comments on that, and I think the jurors did an excellent job. Also, do not be so quick to presume that I would “blow my top.” I did not think your questions were naive, I just thought that they were the wrong questions. Finally, I really don’t think that any of these issues are significant, and I do not intend to repeat the unfair assessments or reopen an already very lengthy and very detailed process. Back to your first point — he is not only allowed to cite work he has written, but also if it has been published under another name he has absolutely no choice but to provide the formal publication details of that item. Yes, ghostwriting does happen, and we anthropologists know of at least several classic anthropological novels written under different names. The point of ghostwriting is that you do NOT reveal your actual name. No, CU does not prohibit that — so I am sorry to hear that where you work you would be fired for it. Finally…what does any of this have to do with CU violating Ward Churchill’s civil rights? Don’t you think, even for a moment, that is the far more important, far more serious issue to be discussing rather than some minor, pedantic details about some footnote? I am glad, of course, that the jury had a clearer mind than to fall for such games. If you want to discuss the important issues, I am here. Otherwise I have no intention nor the desire to go through all that petty muck again. The absolutely hilarious aspect of that Caplis & Silverman audio linked to above by Voltamp, is the way these two shock jocks begin their segment by saying this was all a major victory for CU against Churchill, that the jury saw through Churchill, and that CU had wonderful witnesses, like Regent Michael Carrigan who gave the exact opposite testimony to that of his sworn deposition (perjury anyone?). I’m sorry Voltamp, what were you trying to say about Newill? There are jurors, and then there are morons on the sidelines who live in a bizarro world where everything is everything else except itself. My understanding is that José Limón is a professor at the University of Texas at Austin, and that his name is not Jose Limon, but José Limón. Not really a minor point. Not really a major point either. I have no access to accented letters when writing a message here. You do, so good for you. If you check my posts where his name appears, the letters have accents. I said he was a CU professor, that is a mistake. He was on the CU investigative committee and a witness for CU’s defense during the trial. Are we in a bit of a nit picky mood, as we choose to ignore the broader and more important issues? Given a history in the United States of the dominant society misspelling and mispronouncing Spanish names (see Jane Hill’s The Everyday Language of White Racism), I would think it would be important to make sure that José Limón’s name was spelled the way he spells it. Perhaps, given that you do not have the font capability to indicate accent, you might make note of such things when you post names. As for Ward Churchill, who is not the broader and more important issue, I tend to agree with you and I commend your coverage of this issue. I am a bit surprised that anyone would suggest that the technical inability to post accents is an expression of racism. You misplaced or misunderstood my comment about being nit picky — it has to do with his institutional affiliation. I don’t think his affiliation has anything to do with the subject of freedom of speech. Certainly, it is not an expression of racism either. So the question is not one of being cavalier, but of continuing and reinforcing an insipid discourse of inconsequential mistakes when dealing with the politics of stifling different perspectives. That’s my point. Would you dismiss it? As an after thought: if Jane Hill’s The Everyday Language of White Racism is being properly represented here, I am not sure I want to bother reading it. One might sound “cavalier,” but one might also be wound too tight and produce overwrought melodrama. I find it very troubling that one has to go into technical elements of writing style, as if everyday racism were not abundant enough to not have to go and check if an Anglophone got all his Spanish accents right. It seems petty, unfair, and a bit wild. More than that, it seems to be an extremely weak case for the presence of racism, one that does not deserve to be treated seriously because it focuses on the superficial, and does not take into account some pretty mundane constraints that have absolutely nothing to do with racism. The only thing I can say about ” proof of Indian identity” is what was told to me. A long time ago the Tribe itself decided who was and who was not a member. This is before the government took over. Some Tribes today still believe in this and practice it. I’ve seen it happen when the Tribe adopts a person. The Tribe is then obligated to that person and that person is also obligated in return. Some folks play around with this and do not take it seriously. Others do. I have mixed feelings about it, but at the end of the day, who am I to tell a Tribe how to define its own membership? Thanks George, and that is why this issue is so complicated, because both principles of self-identification and self-determination have been marked as critical indigenous rights especially in international agreements worked on by indigenous representatives themselves, such as the UN Charter on the Rights of Indigenous Peoples. The problem is that in practice the two principles can be set in opposition to one another. Not everyone has retained the right to be a member of a tribe, thanks to termination, denial of recognition, etc. In some cases, self-identification is what leads to recognition and then self-determination as a tribe. There is nothing unusual about Churchill’s situation. The “fake Indian” allegation is typically one used to minimize Indian numbers, and thus Indian rights to land, which is part of genocide-by-definition. In this sense, Churchill’s opponents make themselves into data proving his thesis. What Churchill has done, that many have not, is to prove Indianness through practice, beyond the facts of birth, by developing an Indianist perspective and through decades of work as an Indian rights activist. Not only that, he has self-identified, given some details of his genealogy, and been accepted by one tribe. AIM also had no problem with his Indianness until the split in the organization, and then, looking for the cheapest possible low blow, and a racist one at that, National AIM started to call Churchill a “fake Indian,” added to some other extremely wild allegations that makes them look quite bad, I cringe to read some of the hyperbole and conspiracy theory on their site, they look insane. So as a non-Indian I do not challenge Churchill to “prove” his Indianness, and to prove it for a white audience. There is some fundamental racism there, and I reject it for that among other reasons. Ward has been an Indian rights activist for quite some time. He is accepted by many of us in both academic and non-academic circles. He has many friends and many enemies. Perhaps AIM, like other organizations that survive over a long period of time, got too top heavy with ” too many Chiefs and not enough Indians.” By that I mean, we lost our humility along the way as the years went by. I think our hearts and minds were in the right place initially. Can you imagine how strong AIM could be if we were able to put our disagreements aside and once again speak with one voice. Like you, I would not challenge Ward to prove his identity. I’m glad he’s on our side. Some of us are followers. Some of us are leaders and others sit on the fence and are content to observe, but never participate in life. Ward is a leader.